I am thankful for my dark night of the soul…my journey through the valley of depression. I almost choked, as the tears stung my throat just writing those words. Just thinking back on those dark days and realizing how far I’ve come brings a well of emotion from sadness to great joy and gratitude. “Give thanks in all circumstances; for this is God’s will for you in Christ Jesus” (1 Thessalonians 5:18). That’s a tall order. All circumstances? Cancer, miscarriages, job loss, depression…? ALL. Sometimes it’s difficult to see the redemptive side of situations while we are in the middle of the mess, but that’s exactly where our faith has an opportunity to grow. One day in the middle of seeing patients I doubled over in excruciating pain. I finished my session quickly and took my patient up to my front office where my staff could assist with the next stage in the process while I slowly made my way back down the hall before vomiting then passing out. Rushed to the emergency room, that began a very frightening five months fighting for my life. Surgery was required, and five months of bed rest. I was kept alive on I.V. hydration and nutrition. My weight plummeted from a healthy 113 pounds to a skeletal 74 pounds. I couldn’t work. I couldn’t be the doer, the achiever, the go-getter, much less much of a wife or mother. All I could do was sleep, pray, watch sermons online, and listen to music 24×7. I wasn’t living, in fact, I was barely existing. I remember crying out to God and declaring that if that was all my life was going to amount to, I wasn’t sure I wanted that life. 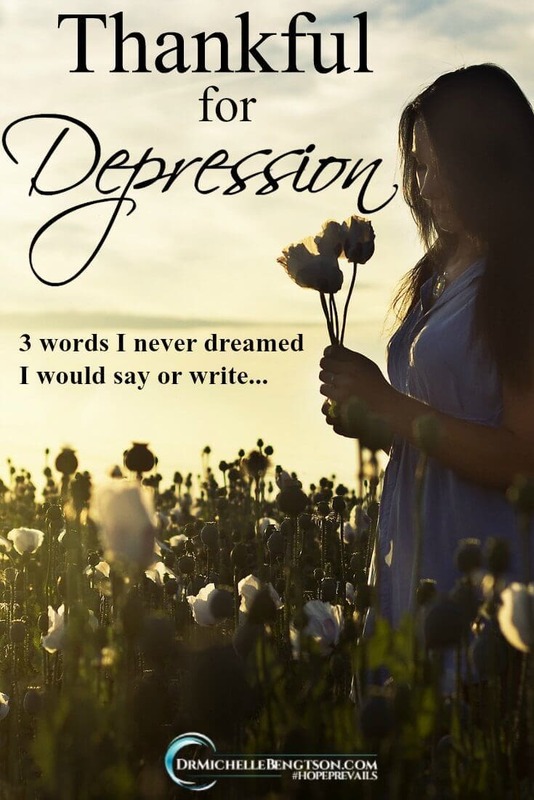 As the weeks turned into months and my physical status continued to deteriorate, so did my emotional health as I walked into the darkest night of my soul. I couldn’t eat, I slept all the time, and I no longer recognized myself in the mirror. Little things like taking my vitamins and brushing my teeth took more energy than I could muster. In my tears of desperation I wept before the Lord as I begged Him to either take me home with Him, or to make my depression count for something; to bring me out of that dark, desolate valley better than I had gone in. “I would have lost heart, unless I had believed that I would see the goodness of the Lord in the land of the living” (Psalm 27:13). That was years ago. I’ve regained my health, and my emotional well-being. 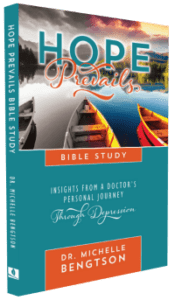 I’ve gone on to write not only Hope Prevails: Insights From a Doctor’s Personal Journey Through Depression but also the companion Hope Prevails Bible Study in response to reader requests. Now I speak, and teach about what I’ve learned, and the hope I found even in the midst of those dark days. Just recently I had another opportunity to share to two different groups: on a Saturday I shared before a group of mentor leaders, and then on Sunday I had the privilege of sharing to a church congregation about where depression comes from, who our real enemy is, and how we have to battle it if we truly want to find freedom for this devastating condition. On Sunday, after I was finished speaking, I was blessed to speak to person after person who stood in line for over an hour, each recounting their own story and how they could relate to mine. That was not the only testimony I heard that weekend. I was honored to hear one after another after another until the church emptied and the doors were being locked. Men and women, young and old, shared their experiences with me, many offering that they had never shared such things with anyone before. And yet, many did so with a smile on their face because they knew that freedom was theirs and they were not alone. I am now thankful for my journey through the valley of depression. I believe it has made me a better doctor. It has deepened my well of compassion and empathy. It has stripped away judgmental attitudes and replaced them with great love, mercy, and grace. It allows me to relate better to some of the stories in the Bible about biblical greats such as Jonah, Elijah, Job, and David, all of whom suffered greatly and yet continued to serve the Lord. It allows me to open an honest dialogue with a simple, “Me too” from a place of understanding and knowing that comes only by experience. It has allowed me to meet some of the most precious people who smile on the outside but ache on the inside, just as I did, but who are just as precious to Him. That makes me almost giddy with excitement because Scripture says God is no respecter of persons, which means He doesn’t play favorites and what He did for me, He wants to do for others. It thrills my heart to now be able to comfort others with the comfort He showed me. So yes, as odd as it may sound, I am thankful for my journey through the valley of depression. Is there anything now that you are grateful for that you never thought you would have said that about? I’d love for you to share in the comments below. Thanks for your vulnerability and being a resource for women struggling with depression. It’s such an important topic, and I’m glad you’re willing to discuss it. Thanks for linking up at #PorchStories too. I’m thankful for the (now) friend who recognized the symptoms of trauma in my life and who, eventually, helped me to agree to see a trauma counselor. I am thankful for the diagnosis of PTSD that helped me to understand who I’d become. I’m thankful for the medication that gradually helped to clear the brain fog enough for me to do more than survive day to day. I’m thankful that I turned on the tv one night to watch Life Today and hear you being interviewed. I’m thankful for the book that you wrote that has brought hope in the midst of my journey. I love this, Pamela! What a beautiful testimony! May you continue to be free from the grips of depression! Saying a prayer for you this morning! It is so good to have something to be thankful for to look back on and see how far you’ve come we may not be where we should but we are not where we were, and one day He will wipe those tears. I too was just able to thank God yesterday for the season of anxiety I have been in. I had a really hard time doing that during my worst but to be able to thank Him now, knowing that my faith has been strengthened and He has never left me, is a wonderful thing. Thank you, Dr. B! I’m always so amazed at how God uses difficult seasons in our lives when we surrender them to Him. Thanks so much for sharing hope as you do.